Our adult pottery courses cover all the basic techniques such as coiling, slab methods, thrown pots and sculpting in clay. Various decorative techniques, including sgraffito, slip-painting, under glazing and glazing are taught. Course dates for Summer 2011 are found below. The courses concentrate on three-dimensional art – sculpture and pot-making, with an emphasis on technical skills development and artistic exploration. Classes are designed to be relaxing and fun, without the pressure of academic qualifications, but with all the support and educational guidance needed to develop good work and gain skills and experience with clay. Students are encouraged to experiment and to develop their own styles and techniques. For those with experience of ceramics, we can expand and develop your skills, sharing hints and tips for throwing or glazing and experimenting with new materials – paper clay, porcelain, engobes and on-glaze enamels. Whatever your prior level of experience, Open Arts aims to tailor the course to your needs. Classes include all clay supplies, use of studio tools, glazes and firings. Studio Equipment includes Slab roller, 8 Wheels, Extruder and more. Our studio does offer firing in our kilns. Please contact the studio via email or phone for firing fees. With CLASS PACKAGES you may drop in any class offered. This is a great option for those who cannot commit to the same day/time each week. Make your reservations by email or phone, 48 hours prior to class. Classes include instruction,1 bag of clay, supplies, use of studio tools, glazes and firings. Classes must have a 4 student minimum. This is only available to those who have previously taken a 6 week class or are very experienced with the clay medium. This class will run Mondays if there are 4 people scheduled 6:30-9:00, please call to reserve your spot. Come on into the studio and join any regular session ceramics class for the day (days/times are listed below)! You will be introduced to the pottery wheel or handbuilding. You will choose a glaze color and we will trim, glaze, and fire your creation. You will be notified when it is ready to be picked up (approximately 10 days). All materials, tools, glazes, and firings are provided and included in the price. 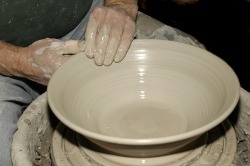 Join us in this great opportunity to give pottery a spin! Reservation is required and confirmation will be made by phone or email. We only need 4 people to run a class so get your friends together and we will arrange a time that works for you. Please be prepared with a box to take work home during the ART SHOW at the end of the session or within the week following. Due to limited storage space and the awareness of other students we can only hold onto ceramic pieces (in progress or completed) for 3 months total. After the first 2 months the studio will give a courtesy reminder call which will allow 1 last month to come by and pick up student ceramic work. Special accommodations can only be made with prior communication.